Lunch in our house is normally the main meal and dinner is usually light. The days when hubby dear has come home late for lunch, we have a very light meal like soups or salads. Two days ago, I made a pasta salad and put everything I could find in the fridge. Yes, there are times when I have a bit of this and a bit of that left in small containers. After adding so many ingredients, this salad was by no means a light meal. But the fruity taste was like nice soothing music playing on the tongue. Sounding poetic…. no, that little spark I had a few years ago has gone off…. no inspiration to write poems. These days the only things I can see is a wedding, my food blog and my social life. So coming back to the salad, I added a blue cheese dressing but you can add whichever dressing you want. Boil the pasta in salted water till just done (al dente). Drain out the pasta into a colander and run cold water over it. Heat some butter in a wide pan. When it melts add the garlic and stir fry till it becomes soft. Add the mushrooms and stir fry it over high heat for just about 30 seconds. Take the pan off the heat. Add the pasta and mix well. This way even the pasta gets coated with the garlicky butter. Let the pasta mushroom mixture cool down. Cut the tomato into half and then cut it into thick slices. Remove the seeds. Roast the walnuts lightly in a pan. When they are cool just snap it into half. Peel the avocado and cut it into thick slices. Pour the lemon juice over it and mix gently. Prepare the dressing by mixing all the dressing ingredients. Add all the salad ingredients into a big bowl and toss it gently. Add the dressing and serve. If you are using thick yogurt for the dressing, then you may need to add a bit more salt. I used English cucumber which has a soft and crunchy skin. If you don’t like the skin then peel the cucumber before using it. Remember some cucumbers can be bitter, so taste it before you add it to the salad. Leave the olives whole or cut into half. 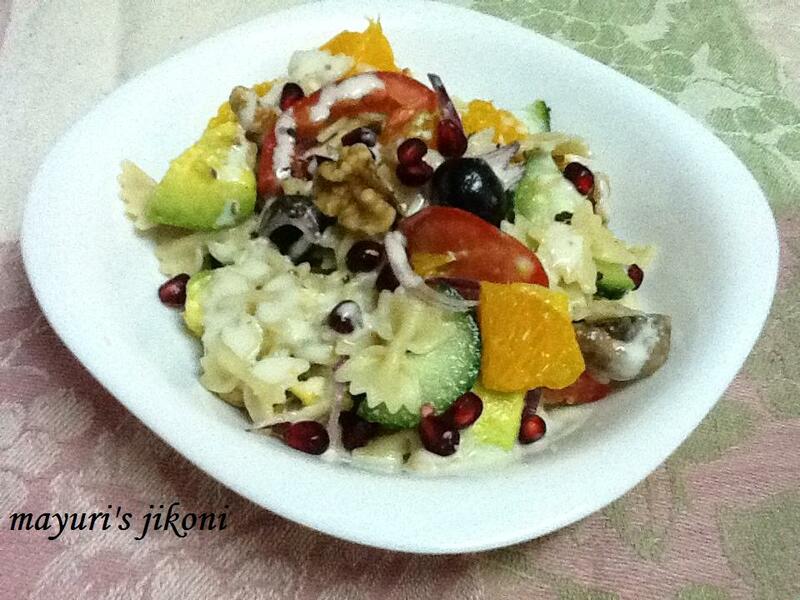 Great salad for picnics and BBQ parties. Al dente means that there is a bite to the pasta and its not overcooked or too soft.